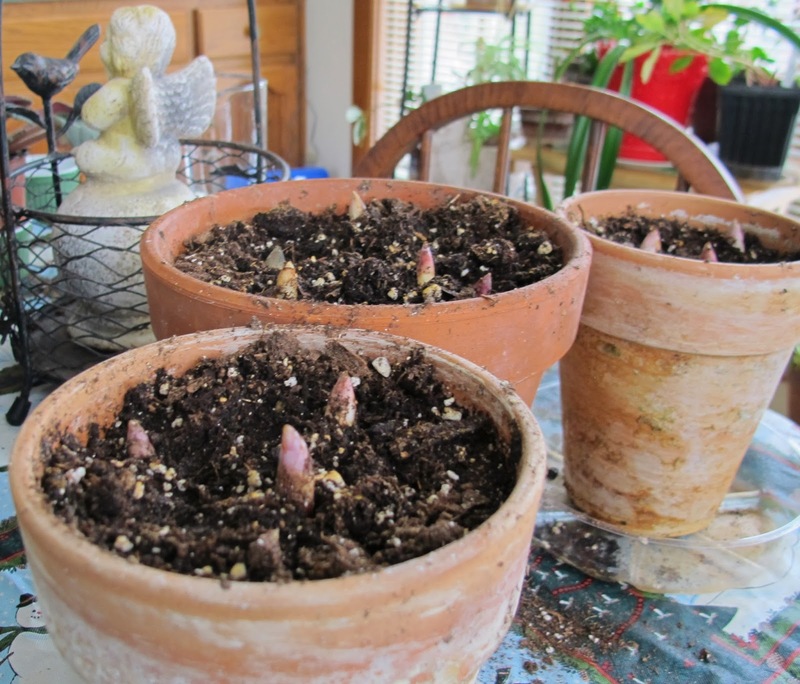 Welcome to Garden Bloggers' Bloom Day for December 2013. 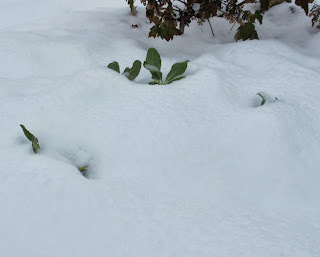 Here in my USDA Hardiness Zone 6a garden in central Indiana, we have snow cover today. I checked past bloom day posts and this is only the second time since 2007 we've been snow covered like this in mid-December. The other time was in 2010. I did put on my boots, coat, hat, gloves and scarf to take a quick walk around the garden. I found the tips of the leaves of the Christmas Rose, Helleborus niger, sticking up out of the snow. This one is the variety 'Josef Lemper'. Once the snow melts, it will provide some nice bloom in the middle of winter, I promise. Brrr... come on in and take off your boots, coat, hat, gloves, and scarf and let's see what's going on in the sun room which is quite cozy, even with windows facing east, north, and west. Yes, this is another Christmas Rose getting ready to bloom. This is Helleborus niger 'Potters Wheel'. I have two 'Potters Wheel' Christmas Rose plants in my sun room right now. I ordered this particular one from Arrowhead Alpines a week or so ago. I also have another one that Jo Ellen, the Hoosier Gardener, bid on for me at a silent auction benefiting a local park. It's not quite as far along as this one so it will bloom a bit later, extending my bloom season for indoor hellebores. 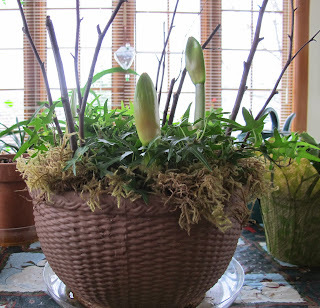 Once these bloom, I'll try to keep them alive in my sun room until spring and then plant them out in the garden. They should then bloom outdoors for me every year. Joseph T. from Arrowhead Alpines thoughtfully tucked another little plant in the box with my Christmas Rose when he sent it, with a note saying it is his favorite Christmas flower. This is Oxalis versicolor, which is not quite blooming but look at those red and white striped buds. Pretty! Thank you, Joseph, for sending this to me. While we are thinking of buds, I have some other buds to show you. 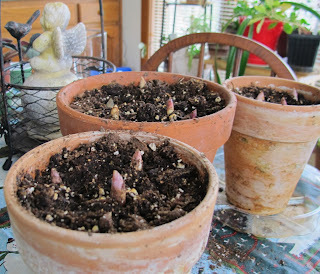 The amaryllis bulbs which I potted up three weeks ago are coming up with big fat buds. I also have some Lily of the Valley pips I potted up earlier this past week. I'm looking forward to the day these bloom. In the meantime, there are some other flowers in my sun room to enjoy this winter including these kalanchoe. I never thought I liked kalanchoe, but since getting these in a funeral planter a few years ago, I don't know how I gardened indoors without them. 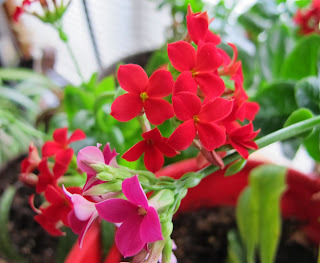 And that's my garden, indoors and out, on this cold, wintry December Garden Bloggers' Bloom Day. What's blooming in your garden? We would love to find out, whether your blooms are indoors or outdoors. Thanks for hosting the GBBD day meme again, lovely to see all your houseplants, I have never tried to grow hellebores indoors, perhaps I should give that a go. I have been meaning to take some Lily of the Valley indoors, have completely forgotten about it, thanks for reminding me, will do it tomorrow! Hi Carol. As always thank you for hosting. We just got our first real snow today followed by pouring rain...such a quick transition. I was able to run outside quickly and get some photos before everything was covered in white. Your indoor flowers are lovely. No matter what happens true gardeners always find a way to enjoy those blooms! Happy GBBD! Thanks for hosting too, this very much awaited monthly gathering. While most of you have winter, we are still having our usual perennial reds and orange, that most of you only have stuck in the greenhouse. Happy returns everyone. I never thought of growing hellebores indoors - I'll try that next winter! Here it's summer, but crazily one of my hellebores has just put out some fresh flowers. They are one of my favourite flowers, so I'm happy to see them whatever the season! You certainly have got a covering of snow, just as well you have all your lovely flowers inside. You have a beautiful selection, they will keep you happy until your snow goes. Keep warm and cosy! Those houseplants look most cheerful after your walk in the snow. Your point about the weather is interesting. It often follows that what happens in the US crosses the pond. 2010 was a long and hard winter for us too. Ouch. Being part of this meme has been fascinating this year and made me focus on having a garden for all seasons. Thanks for hosting Carol. Thanks for hosting the GBBD day meme again. I'm glad that you took us indoors Carol where your plants look snug and cosy. Your sun room will soon be filled with delicious scent when those lily of the valley flower. Thanks for hosting GBBD throughout 2013 - it's much appreciated. Our weather has been truly annoying. 70s for days at a time..then we get a freeze. Some of my roses have held...most have stopped blooming but just about all still have their leaves. I've never seen an Oxalis with such bright blooms--looking forward to seeing these pretty blooms again when they're fully opened. Not much blooming here, but we finally got some snow, too, which makes the garden look so much more Christmasy. Thanks for hosting this once again, Carol. Hi Carol -- Thanks for hosting. Those lilies of the valley are going to be so pretty! Your plants look beautiful! 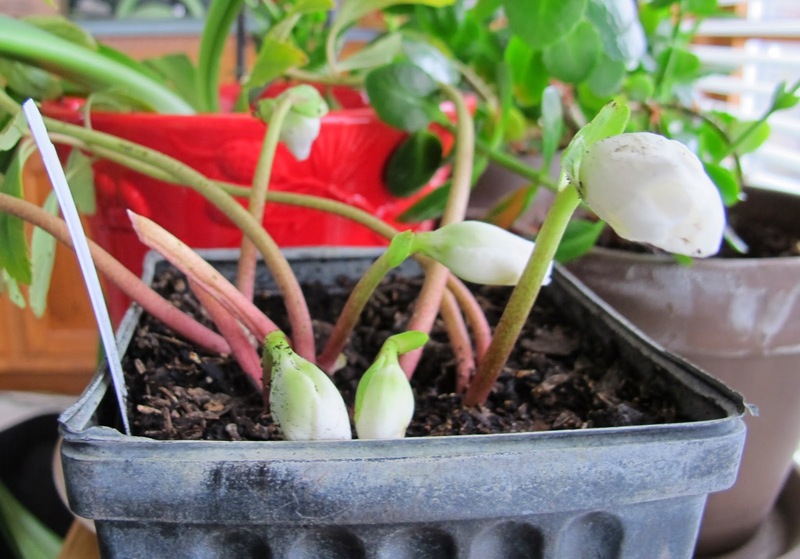 Oxalis versicolor buds are delightful and I can already smell the lily of the valley blooms! I've never forced the pips inside but have heard of another blogger who did it this year and now want to try. We just had a big freeze in the western part of the country so my bloom day isn't as floriferous as it has been in past years but there are still a few things blooming out there. Happy GBBD and as always, thank you for hosting the party! Lovely buds popping up! 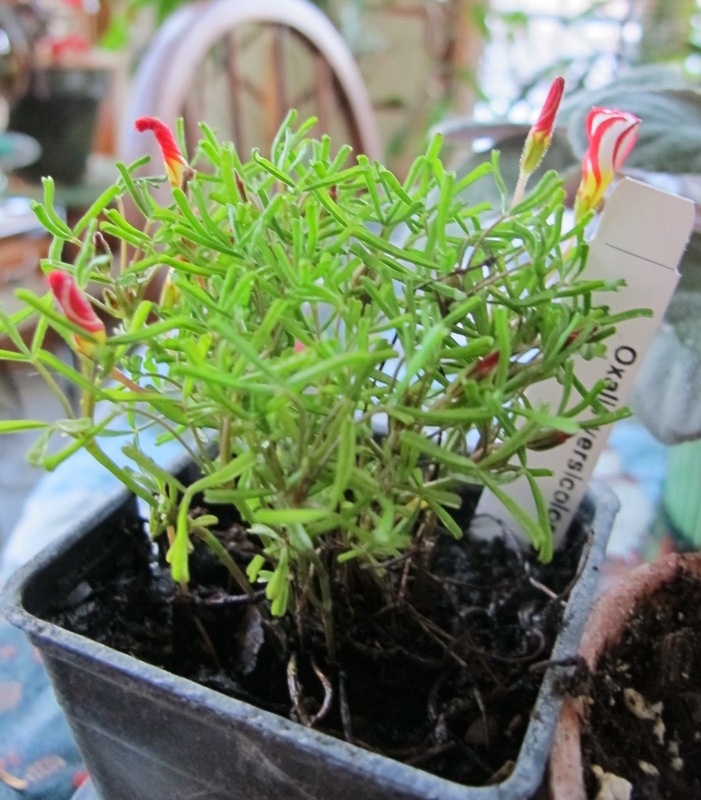 I've never heard of Oxalis versicolor - hope to see the open blooms on your blog soon. Thanks for hosting Bloom Day! Happy holiday and happy Bloom Day to all. Carol, thanks for hosting GBBD! I hope you enjoy your white Christmas. The cheerful blooms in your sun room should certainly brighten up those cold mornings. Sorry you're under so much snow right now but your indoor plants look very promising Carol! I haven't managed to get a post together yet, it was too windy to get some pictures. I'll try again tomorrow. You're absolutely inspiring! Your Amaryllis is about as far along as one of mine, but your other indoor plants are great inspirations for coloring up your indoor world. Thanks for sharing! Thanks for hosting! I've already read some of the other posts and really enjoyed seeing some beautiful blooms in the middle of the snow and ice field that we have here! Snow! This time last year it was cold in the UK but we are currently experiencing a mild spell, so no sign of snow yet. Lovely to see your named varieties of Helleborus niger - mine is named but I forgot to check before it got dark. I like the way you have grown your amaryllis - I have one waiting to be planted and I might borrow your idea if you don't mind. Thanks for hosting. Cactus and African violets here! Ah that Joseph! We had the cold temperatures, but not the snow. You can go ahead and keep that please. Happy Holidays Carol! Thanks for hosting, and glad to see you have some blooms! Just an amaryllis in my post this time. No snow for me, but I am doing a little window sill gardening too. Carol, thank you for hosting yet again, and I wish you a merry Christmas and a happy new year. Look at everything growing there Carol....I must remember to try a few of these. I'll be linking in tomorrow. Thanks for hosting this great chance to see gardens all around the globe !! I have even more snow cover than you do. I can't see any of my hellebores at all. And I find I don't want to take care of any of my indoor plants. I just want them to look great without any help from me. What is wrong with me? That oxalis looks delightful. We have snow too, so nothing happening outdoors. Happy Holidays! I need to dig some Lily of the Valley pips to enjoy indoors, do they bloom earlier than the outdoor ones for you? Do you force/chill them? Even though some of us may not have bountiful blooms in December, I appreciate that you continue to host GBBD! I have never seen that oxalis before but it does look pretty and interesting! Happy Bloom Day! I had forgotten it was GBBD until I saw Dorothy's post! I even had to go and buy some blooming plants! LOL! I forgot about Bloom Day! It's too dark out to go take photos of Pineapple Sage, Gerbera Daisies and Lantana that may or may not get nipped tonight, and Camellia blooms too. I made blog posts today about my Christmas Cactuses in 5 colors. Maybe I can just link them. Hellebore are amazing plants, I'm treating myself to a double cultivar this sprng! My blooms are all indoor blooms but we've had a very sunny day today so who knows what will pop up later this week. Would you believe? I have Hydrangea arborescens 'Winter Storm' in full bloom for Bloom Day. There's not much blooming outdoors here so I have some indoor flowers. I like the candy-striping on the Oxalis blooms! I haven't thought of digging Lily of the Valley bulbs to force, that sounds lovely. You've inspired me to pot up my amaryllis bulbs this year - usually I plant them in the garden, with varying success. Happy GBBD! You have some beautiful plants in your sun room! Merry Christmas! After thinking my post a meager one, I'm feeling much luckier than many other gardeners here. We've all had some weird weather! I'm here from Rose, Prairie Rose Garden. Every month I show my garden in GBBD as well although here in North Europe, Saint Petersburg we have truly winter and snow in December. I love your blog and especially your flowers starting bloom now! Better late than never. December is a cold month but bright with holiday cheer! Wow, this is as late as it has ever been for me to post on a GBBD. I have to say that yesterday was pretty cold and wintry around the hillside here in Maryland. I too have the lovely Oxalis versicolor. They buds are beautiful as they unfold. Check my posting for a number of other oxalis. My Bloom Day contribution was so scarce, that I paired it with frozen foliage for Foliage Follow-Up. Thanks Carol for hosting. I'm already hankering for spring! We are all covered in snow here as well :) Merry Christmas to you, carol! Thank you for hosting. That oxalis is a hit. Meanwhile, my cotoneaster is colourful but definitely more mundane. Hi Carol! Thank you for hosting GBBD. And super sorry for not linking from my blog earlier. I just don't know how I missed it!! I decided better late than never, haha! Thanks for hosting again this month, and Merry Christmas Carol!